I'm thinking that the worm was modified for the user. He changed all the locations, file names and user info. It may not be the one but probably the model for the one we are looking at. Perhaps its a corporate PC and the local sysadmins install all PCs that way. They may have a ISO CD for installs with it all set up or they connect remotely and just install it and the users does not know. All can be done. They change the files names & locations so its looks less obvious? I don't believe that anyone would be stupid enough to link his own business to a bogus seti account. Maybe Carsten could clear things up by posting here. Message 240427 - Posted: 31 Jan 2006, 20:53:22 UTC - in response to Message 240425. Yes, that's what I asked him to do when he replied my email. He wrote he did not know how to write viruses. I wrote I'd be very interested in his opinion and explanation, since I assume he had to see the RAC increase. I am just afraid he won't answer anymore. 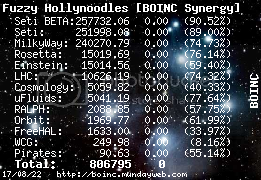 I am temped to call him, but again, I am no official BOINC representant, and it is not my business to make any such investigation. sounds fishy to me. My opinion is just that...an opinion, and is only based on hearsay evidence posted here. it's subject to change...of course. Message 240430 - Posted: 31 Jan 2006, 20:59:14 UTC - in response to Message 240425. Still, I believe he would certainly notice that he has far too many hosts in his account. And the single case that came out, was almost certainly not the only one. I do not think he did not know what is going on. But I agree I would love to hear from him some reasonable explanation anyway. Message 240435 - Posted: 31 Jan 2006, 21:16:17 UTC - in response to Message 240169. Umm i dont know if this has anything to do with a virus. But the process on occasion does not terminate for me either. When i exit Boinc and i mean exit NOT minimize, the process is still running. This doesnt happen very often but it does sometimes. But the same thing also happens when im running CPDN, after i exit Boinc the process is still running. I found out about this a while ago but assumed it was just a bug or something so i never said anything. Both the CPDN and Seti processes will terminate if i click "end process" however. Message 240438 - Posted: 31 Jan 2006, 21:19:29 UTC - in response to Message 240435. This sounds like the normal operation of Boinc installed as a service. Message 240439 - Posted: 31 Jan 2006, 21:21:35 UTC - in response to Message 240438. But why would it sometimes end and sometimes not? The process usually goes away when i exit Boinc, but on occasion i notice its still running. Message 240440 - Posted: 31 Jan 2006, 21:23:54 UTC - in response to Message 240435. Umm i dont know if this has anything to do with a virus. Yes, I have my doubts about the virus part, but even if it was not installed by a virus, it still does not explain how a Brittish (?) guy got BOINC account of a German guy installed on his PC. In the meantime I received another reply from Giese, briefly telling he has no idea how it happened. He did not explain why he did not react when seeing unknown hosts in his account manager, or the increase in RAC. Message 240441 - Posted: 31 Jan 2006, 21:26:56 UTC - in response to Message 240439. I've seen PPAH stay running after boinc shut down, but not any other program. This was 9-12 months ago or so, and I haven't seen it since. I don't know. Message 240444 - Posted: 31 Jan 2006, 21:35:38 UTC - in response to Message 240304. Sure, but what or who are the 'right places' to inform, how to contact them? When the 'right places' start getting hundreds of reports of a program called BOINC mysteriously using 100% of their CPU, how do you think the right places will notice one little e-mail saying 'Hi guys, BOINC is alright, I promise, I wrote it'. The problem is that rumor and conspiracy theory is bigger than and travels faster than, the truth. This thread is already no doubt being indexed by Google. Don't expect someone using the search words 'BOINC virus' to bother with the tiny detail of reading the text, a match will be enough to prove the case. If certain critical mass is reached, there will be 1000s of know-nothings reporting bad news, for every 1 who does know trying to tell the truth. The larger number wins. Matt is one of the right people, and I assume that he knows about the problem because he has replied to the thread. Leav it to him. Message 240480 - Posted: 31 Jan 2006, 23:32:05 UTC - in response to Message 240440.
i totally agree with your point and since your're allready in contact with "Carsten Giese" you could ask him to change his password. ( This would emliminate the abouse if his email accout and his password, but still left the attaching via account key open, but anyhow one chance to get the thing resolved and only one choice left that the "abused" account info is not using the password and email to attach to the project). I just got off the phone with Rom Walton, one of the Berkeley Devs. He informed me that they (SSL/project devs) are aware of this situation, and that they are currently investigating it. It will be given their full attention. From what I understand, Matt is leading the investigation. Message 240493 - Posted: 1 Feb 2006, 0:05:14 UTC - in response to Message 240487. Message 240497 - Posted: 1 Feb 2006, 0:11:59 UTC - in response to Message 240493. As I posted 7 hours ago, I mailed both Matt Lebofski and Rom Walton with a link to this thread. So I don't think it's necessary to do anything further, as they are aware of it.